The focus of my blog is to review book series and not individual novels, but writers are going to continue writing novels within a series even after I have done my review, so I plan on reviewing the individual novels as they come into circulation. 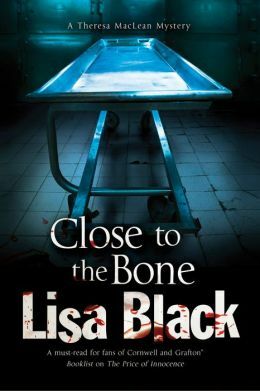 Lisa Black just recently added book #7, Close to the Bone, to the Theresa MacLean series. Lisa Black is unique to the Forensic Thriller genre in being, a far as I know, the only author that is actually a CSI investigator. Unlike other authors in this genre that are professionals such as physical anthropologist, medical professionals, or lawyers; Black is the only one that is actually on the front lines during a homicide investigation and is involved in various tasks of the investigation which includes fingerprint and trace analysis. Being the specialist that she is, I am sure that her stomach curdles every time she watches a CSI episode on TV and sees the actor or actress improperly doing techniques that she herself has done numerous times. I also get the sense that in her latest novel, Close to the Bone, she wants to set the record straight for all her readers on forensic techniques that are egregiously presented in fiction, in particular, fingerprint analysis. My 86-year old mother used to work in the 50s for the FBI as a fingerprint technician. This was long before there were computers and everything was done manually, so identifying a fingerprint in the huge FBI repository could take days if not weeks to identify and was based solely on fingerprint patterns of whorls and loops. Nowadays, computers have simplified this process tremendously but according to Black it is not as simple as CSI: Miami would like you to believe, so she gives us readers a glimpse inside the real world of fingerprint analysis which is kind of neat if you are a forensic junkie but might be tedious if you are not. This latest addition of the series has our protagonist, Theresa MacLean, caught in the middle of a payback rampage of an ex-con seeking revenge for being wrongly accused of the murder of his wife and his quest to find the real culprit who unfortunately seems to be a member of MacLean’s home turf, the Cleveland Forensic Unit (CFU). In the previous book of the series, The Price of Innocence, MacLean exposes her former boss Leo DiCiccio of foul play, so once again she has an opportunity to go after another member of the CFU. It seems that MacLean is working hard at trying to boost her resume so she can get a job with Internal Affairs. With the exception of my most favorite character in the series, the curmudgeon trace analysis expert Oliver (no last name here), this novel is devoid of all of the recurring characters of the series which includes her police officer cousin, Frank Patrick, who is off on a cruise, and her daughter Rachel, who is off to college. The weakest point of the series is lack of character development and an addition of a few new characters is promising which includes, DNA analyst Don Delgado, diener Mitchell Causer and Queen of the Secretaries Janice which are all fun characters and will hopefully become regulars to the series. Black also leaves us with a rather awkwardly written cliffhanger on a possible future relationship for MacLean. Close to the Bone, may not be Black’s best work but it still is a quick fun read especially for us forensic thriller fanatics. To learn more about the series check out Lisa Black’s Theresa MacLean Series. Posted in Forensic Thriller.Tagged Book Review, Book Review Blog, Crime Thriller, Forensic Fiction, Forensic Mystery, Forensic Thriller, Lisa Black, Theresa MacLean, Thriller.